Pistachios are a heart-healthy nut full of nutrients to benefit your weight loss plan. While they're relatively high in calories, a diet rich in nuts is actually linked to leaner body composition and healthier body weights, according to the Linus Pauling Institute. Portion out your servings of pistachios ahead of time and leave them in the shell so it takes longer for you to get to the nut. If you are starting a new diet, let your health-care provider know ahead of time. One serving of pistachios is 49 kernels, which is about 1 ounce of shelled pistachios. Enjoy one serving between breakfast and lunch, or one between lunch and dinner to help set you up for weight loss success. Or, instead of having plain pistachios as a snack, add them to your salad at lunch or toss them in with your favorite pasta creation at dinner. The added texture and flavor adds a little something extra to your dish. 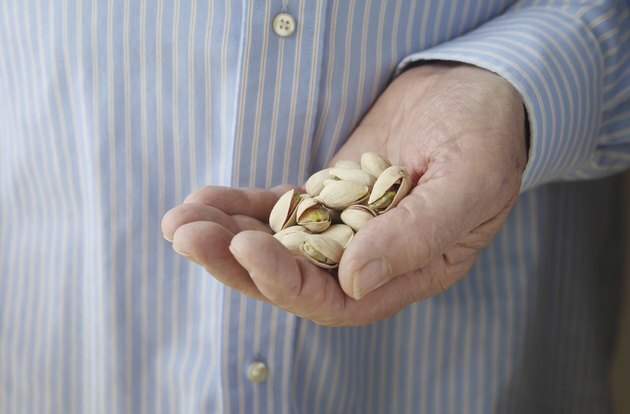 One serving of pistachios offers less than 161 calories; approximately 45 of the calories come from fat. The remaining calories come from protein and carbohydrates. Although they don't count as a low-calorie snack, pistachios can still help you lose weight if they take the place of junk food in your diet. For example, if you switched a 2-ounce serving of potato chips for a 1-ounce serving of pistachios 3 times each week, you'd lose almost 7 pounds over the course of a year. Pistachios offer a modest amount of protein. The 6 grams present in each 1-ounce serving provides 13 percent of the protein needs for women and 11 percent for men. This protein serves as a source of amino acids, which your body uses to make antibodies -- proteins essential for immune function -- as well as new muscle tissue. Protein also takes a while to digest, which means the protein content of pistachios will help keep you feeling full between meals. While the high fat content may sound discouraging for your diet plan, the fats in pistachios are healthy monounsaturated fats, or MUFAs. This type of fat has been shown to improve cholesterol levels, thus decreasing your risk of heart disease. According to research published in the "Journal of the American College of Nutrition" in 2010, enjoying moderate portions of pistachios daily may help to improve triglycerides. While triglycerides are not cholesterol, they are a type of fat in your blood that can increase your risk of heart disease when levels get too high. The study also concluded that adding pistachios to your weight-loss regimen may help to improve your weight loss efforts, especially if they replace starchy, low-nutrient foods such as pretzels. Like protein, fat makes you food more filling, so you're less likely to binge between meals out of hunger.